Abergynolwyn Trails at Dyfi Forest (NRW)0300 065 3000work Nature TrailNant Gwernol, a rocky river gorge with cascading waterfalls, lies above the picturesque Tal-y-llyn valley in the shadow of Cader Idris. 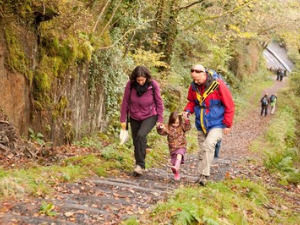 The three trails that start from here follow the riverside and explore the remains of Bryn Eglws Slate Quarry. Please take care not to stray from the paths as the old works are dangerous. The Stations Link (1 mile, 1.6 kilometres). The Stations Link is a linear route between Nant Gwernol station and Abergynolwyn station - there is a steep climb if you start from Nant Gwernol and a steep descent from Abergynolwyn. The trail offers views of the surrounding mountains and the Allt Wyllt incline, part of the former quarry. Please be aware of trains when walking over the level crossing half way along this route. You can park and start your walk from Abergynolwyn village hall or take the steam train from Twyn to Nant Gwernol Station. The Casade Trail (1 mile 1.6 kilometres). This trail closely follows the tumbling upland river. It then crosses a wooden bridge onto the old tramway and descends steeply alongside part of the old Allt Wyllt incline back to Nant Gwernol station. The Quarryman's Trail (4 miles, 6.4 kilometres). This is a fairly strenuous walk with long climbs and steep descent]s. It visits the ruined mine workings of Bryn Eglwys with expansive views of Cader Idris from high above Nant Gwernol Station. To start the walks, park in the village of Abergynolwyn and take the short but steep walk to the station from behind the Community Centre/Cafe. The three walks start from Nant Gwernol station but there is no parking at Nant Gwernol station itself. Either park in the village of Abergynolwyn and take the short but steep walk to Nant Gwernol station from behind the community centre/café. Alternatively park at Abergynolwyn station car park and take the linear Stations Link walk from Abergynolwyn station to Nant Gwernol station. Nant Gwernol, a rocky river gorge with cascading waterfalls, lies above the picturesque Tal-y-llyn valley in the shadow of Cader Idris. 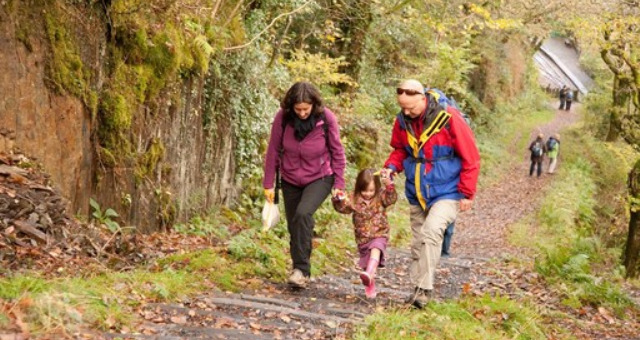 The three trails that start from here follow the riverside and explore the remains of Bryn Eglws Slate Quarry. Please take care not to stray from the paths as the old works are dangerous. Accessible toilet at Tan y Coed. Toilets at Abergynolwyn Station and Abergynolwyn Community Hall. Please note: Sometimes we need to close or divert trails for your safety whilst we undertake maintenance work or forest operations. Occasionally we may have to close a site in extreme weather, such as high winds or snow and ice due to the risk of injury to visitors or staff. Please always follow any instructions onsite and make sure you follow any temporary diversion signs in place. By car take the B4405 that joins Tywyn and the A487 at Minffordd. OS Grid Reference: SH681067.